Legal Documents Needed to Buy or Sell a House in FL | DeLoach, Hofstra & Cavonis, P.A. What legal documents will I have to sign when buying a house? There will be many different documents that require your signature before you can complete the purchase of your new home. 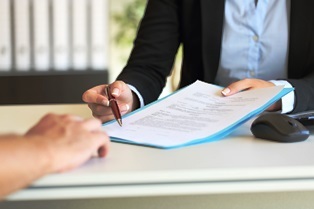 The specific paperwork varies depending on the exact location of the home, but it's not uncommon to sign 20 or more separate contracts and attestations before the transaction is final. After long months of waiting to get into your new home, it may be tempting to close the deal and get your keys as quickly as possible. However, it's important not to rush through the signing process. Each of these documents plays a vital role in your transaction, and you should take the time to read, review, and complete each one before signing. If you're using a mortgage lender to purchase the property, you'll have two closings: one for the loan and one for the purchase of the house. The loan documents will be prepared by your lender’s agent, and vary by the type of lender and loan you've chosen. Promissory note. This document outlines the terms of your home loan, including interest rates and monthly payments. When you sign this document, you're making a legally-binding promise to pay back the borrowed amount, plus interest. It also gives the lender the ability to collect the debt, or sell the debt to another lender. Loan estimate and closing disclosure. The federal government requires all lenders to provide a “truth in lending” statement to borrowers who are approved for a mortgage. This document shows the amount borrowed, the interest rate, the annual percentage rate, and the total cost over the life of the loan. This allows borrowers to easily see the amount they're responsible for repaying. Mortgage. The mortgage is your acknowledgement that the lender will have a lien on your home until your home loan is paid off. When you sign a mortgage, you're agreeing to use the home as collateral for the loan, allowing the lender to foreclose and sell the property if you don't make payments. Loan application. You're required to inform the lender if your financial situation has changed—for example, if you have changed jobs or spent some of your savings—before your loan is issued. The lender’s agent will ask you to review your original application, update any inaccuracies, and sign a new copy. Monthly payment statement. This document provides a breakdown of your monthly mortgage payment, allowing you to see how much of each payment goes to the principal balance, interest, taxes, and insurance. The documents needed to close on a property are usually signed by the seller first, then delivered to the buyer for his or her signature. Closing disclosure. This document outlines all closing costs for the buyer and the seller. The law requires buyers to have this form at least three days before closing so they can ask questions and resolve any issues before the date of signing. The deed. This document itemizes the legal description of the property. Once signed, it's filed with the county recorder of deeds, officially transferring the property from the seller to the buyer. Once the deed is recorded, anyone performing a title search can see that you obtained title legally from the prior rightful owner. The bill of sale. The bill of sale lists all property being transferred from the seller to the buyer along with the property, such as furnishings, appliances, light fixtures, satellite dishes, water features, or security systems. Seller’s affidavit. The seller is responsible for providing a notarized statement attesting that he or she has rightful ownership of the property being sold, as well as identifying any potential claims on the title, such as outstanding leases, liens, boundary line disputes, or pending sales contracts. Abstract of title. The abstract is a summary of the public records related to who may claim ownership over the property. Your attorney should examine the abstract of title carefully to see if there any additional parties that could claim ownership over the home. Even if a seller performed an adequate title search, the buyer is still answerable for any claims that are made on the property, so it's a good idea to purchase title insurance when buying a new home. Tax declarations. Like most states, Florida levies a tax whenever property passes from one person to another. In Florida, it's called the documentary stamp tax, and is paid when the deed is filed with the county clerk. There will also be a proration agreement describing how much the buyer and seller will pay to split the outstanding property taxes. The road to your new home can be long and frustrating. Let our experienced real estate attorneys answer your questions and ensure you don’t run into problems in the future. Simply fill out the quick contact form on this page to set up a consultation. Why Do I Need a Real Estate Attorney When Buying or Selling Property?